New York City–it’s home to 8 million people trying to make their way through the day–a crop of humanity seething with hopes and fears, dreams and nightmares. Autumn comes, and nine authors harvest nine tales from this unique setting and people. From stories of everyday life in an otherworldly light to nightmarish tales of human darkness, Urban Harvest has something for everyone. 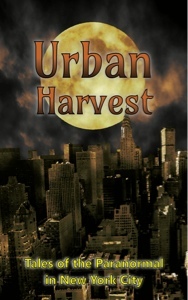 Urban Harvest contains tales of the paranormal from Alex Shvartsman, Laurie Treacy, Donna Ansari, Tara Hill, Laura Wenham, Andrea Stanet, Don Corcoran, Saif Ansari, and Sean Sakamoto. In keeping with the spirit of harvest, all proceeds from this anthology will go to support City Harvest, an organization that feeds NYC’s hungry. Laurie Treacy is one of the authors featured in Urban Harvest: Tales of the Paranormal in New York City. As a writer, I like the possibilities presented by the paranormal genre, not knowing about the unknown, about ‘otherworldly’ creatures and realms. What a creative playground for writers to play in! I wrote a paranormal New Adult short story, “Powerless,” which will be included in the Stalkers anthology edited by Cynthia Shepp and Rene Foslom. I also wrote an adult paranormal short story “Just One Bite,” which will be part of the In Vein vampire anthology, edited by Jodi Pierce. Both anthologies are expected to be published later this year. I am also writing two Young Adult novels, a paranormal, Strays, and a fantasy, End of Silence, finishing up my YA paranormal, Everlast, besides other works-in-progress. Do you consider your writing character-driven or plot-driven? My writing is definitely character-driven. On my blog (www.laurietreacy.com) I call myself “The Story Channeler.” I feel like Theresa from TLC’s Long Island Medium, except I hear the voices of characters telling me their stories. I’ve learned whenever characters begin speaking or images pop into my mind, I grab paper or my laptop and get it out. It could be a page or two or even longer, but those spurts of inspiration can lead to short stories or novels. I let the characters take the lead. Much like baking, the plot rises out of my stories during my writing. I do like to roughly outline first and then I will go back and plot the story. Do you have a writing mentor or inspiration? I don’t have one particular mentor. I regard inspiration like a sponge seeking water. I am inspired by the books I read and love. As a frequent conference attendee, I am fortunate to meet many in the industry, listen to them talk about their own journeys and that inspires me. I am also inspired by images, pictures, paintings, and by nature. Many times I stop driving to capture a picture of something because it speaks to me. I never know when I may need that picture for creating a particular setting or as the catalyst for a story idea. I wanted to be a writer ever since I was a kid. Growing up in New York City, I spent many summers in the public library, lost in books. I still have two books I began writing when I was in the sixth grade (of course, both were Young Adult stories, one paranormal, one contemporary romance). In college I was very active with the school newspaper and literary magazine, majored in Journalism, and won some writing awards (I won an award from Columbia University for my Bruce Springsteen record review which was really cool). I try to block out some hours in the morning but that doesn’t always work. I will say whenever inspiration strikes, I do pay attention so you may find me writing while waiting for my daughter at dance or while my son is practicing soccer. I need to write where I can see the outdoors and make sure I can listen to the playlist for that particular work. I’m really looking forward to Nanowrimo this year. I have a title and story outline all ready to go. I’m excited ever since I was inspired by an urban exploration I went on. It will be a New Adult paranormal. I’m a member of the SCBWI. I love to write YA and read a lot of books in this market. I’m also an active book blogger at Reader Girls, a blog I started in 2009. I get to meet many wonderful authors, publicity people, and other readers as well as discover new and exciting books. The following is a short excerpt from Laurie’s story in Urban Harvest. I do. We’re wasting our time, but I shut my eyes and don’t complain. Keeping my mouth closed comes easily living with my father. I like being around Colton. My mind turns into a smart board on Monday mornings. Within seconds, they barge in. Voices. Sounds. Lots of them. At first muffled, then clearer. Then shuffling. Hurried steps. Climbing. Huffing from heavy lifting. My heart races as I scan around. The area is empty. But I can almost feel a presence of something big, something looming ahead. The waves are faster here as they crash against the bank, spitting froth onto our boot tips. Colton’s grip tightens as I’m tucked in beside him. “Do you believe, Maire?” he asks, his tone excited. I want to dismiss him as weird. I can’t. Something is going on. This book is on my must-read list! Love anthologies, and this one sounds great! Looks awesome putting it on my TBR list :) Thanks for the giveaway!